Trina Mitchell finally has her life back on track. Fully focused on her first semester of med school, she isn”t looking for the love of her life. But a little no-strings fling with hunky contractor Christian Evans? Now that feels like a gift from the gods. Until she learns her humble contractor is actually the star of a popular home improvement show–and completely out of her league. Chris has been building his brand as a celebrity contractor and he”s this close to all that hard work paying off in the form of a big primetime gig, but only if he carefully protects his image as a TV heartthrob–which means absolutely no romantic complications allowed. Not even the one girl he can’t seem to get out of his mind. Love is a distraction neither of them has time for, but when Trina learns their one magical night together is going to have some very real consequences–in around nine months–she needs to find Chris again, stat. In love and renovations, nothing ever goes as planned. But with a little help from fate, this might just be the perfect time to build their happy ever after. Only one problem: Even in the tiny town of Haralson, Minnesota, there are six Chris Evanses! SIX! What follows are six delightfully romantic tales that start with Ellie meeting each new Chris Evans. But while she doesn’t find true love (yet! 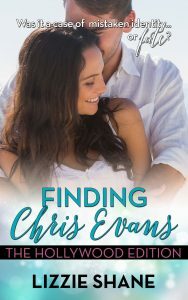 ), her meeting sets off a chain of events that leads the Chris Evans in each story to fall in love with a heroine all his own. Then finally, in the sixth tale, Ellie’s psychic prediction comes true in a charmingly perfect and heartwarming way. Because true love never fails! Now’s your chance to fall in love with Chris Evans, too–six different times! VISIT www.FindingChrisEvans.com FOR MORE DETAILS.